Halfway through the Premier League season, a stylish team from North West England has distinguished themselves as the sole front runner for the EPL title, holding a six-point gap over a flawed team from London. Also, Manchester City are in vague contention. City were supposed to run away with the league again, and now they’re all the way down in third. After today’s results, Liverpool are now seven points clear of City, a considerable gap given how close the race has been all season. The Pool Boys laid a 4-0 smackdown of Newcastle today, which is the sort of result both title contenders had been putting up all year until this week. However, four days after dropping a weird one to Crystal Palace, City stumbled again, falling 2-1 to Leicester City. And in a league as ruthlessly competitive as the Premier League, they can’t really afford to slip up any more. How did it get like this? The simplest answer is injuries. 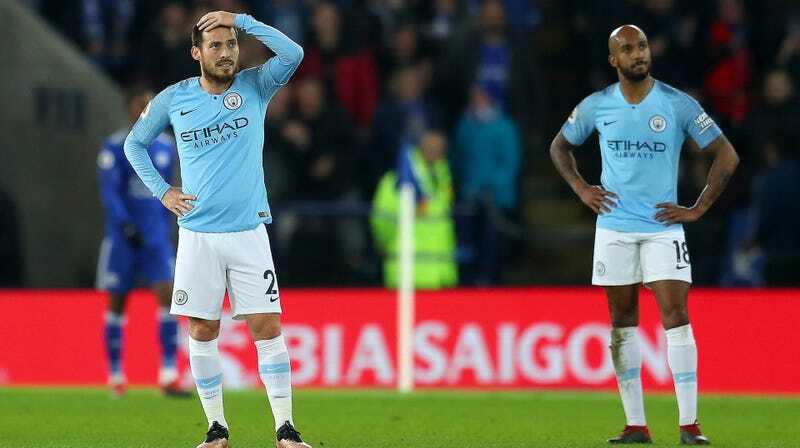 This month alone, attacking stalwarts David Silva, Sergio Agüero, and Kevin De Bruyne all missed time (De Bruyne at least made his first league start of the season today.) As Chelsea would tell you, City’s attack hasn’t been as devastating over the past month or so, though their more concerning issue is not on that side of the ball. It’s on, uh, this one. Ricardo Pereira’s game-winner was an A1 screamer that nobody was going to stop, though it’s far from the only goal City have given up recently. The team hasn’t kept a clean sheet in over a month, and the defense has been noticeably less stingy without left back Benjamin Mendy. Fabian Delph is not a suitable replacement, and Leicester pointedly picked on him today. Look how easily he was beaten back post on Leicester’s opener. Most concerning of all is the lack of midfield depth that has essentially made Fernandinho indispensable. The pugnacious Brazilian is a perfect one-man defensive midfield, and his organizational acumen allows City to play with such a creatively robust team up front. Without him, City are forced to either play Jon Stones in defensive midfield or slow Ilkay Gundogan into the Fernandinho role. Neither is a clean solution. Pep Guardiola has bemoaned his team’s lack of depth, but he also knows how tight the margins are. “We’re going to Leicester needing to win. Last season we dropped points and immediately won again. That’s what we have to do,” he said. For all the bad signs, City absolutely can still win the league. They have 19 games left and they are talented enough to run the table, though they will have to stay healthy. The problem is that there’s simply no margin for error. A win against Liverpool in a week would put them right back into the swing of things, and City might actually have to come out swinging in that one. This one’s not over, it’s just a lot more tense significantly earlier than expected. So, who can save them? Only young American keeper Zack Steffen, probably.